Indian Puzzle Championship (IPC) and Puzzle Ramayan (PR) Offline Finals were held in Quality Inn, Chennai on 30th July, 2017. This was one day after Indian Sudoku Championship 2017. 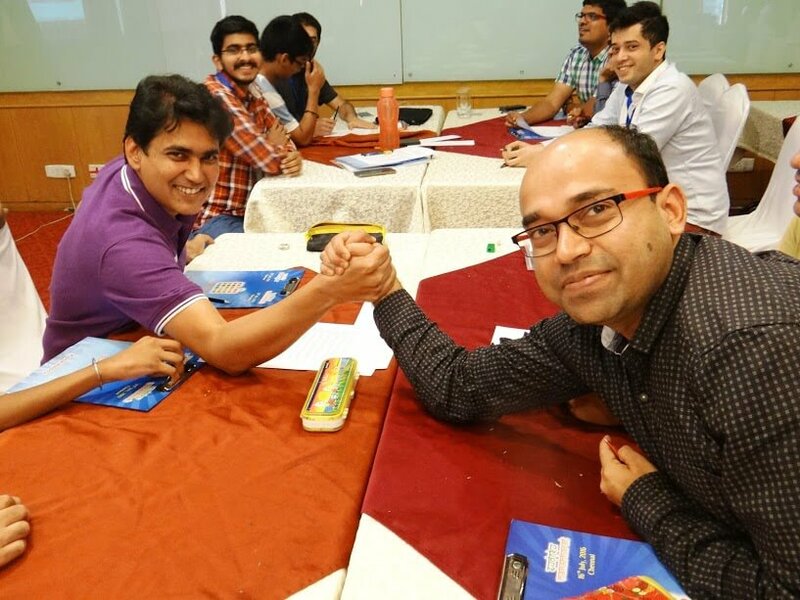 I have already written my experience during Indian Sudoku Championship 2017. Now its time to write about Indian Puzzle Championship 2017. Qualification to Indian Puzzle Championship 2017 Offline finals were through the 4 online Puzzle Tests of Puzzle Ramayan 2017 which were conducted at Logic Masters India website from January 2017 to April 2017. 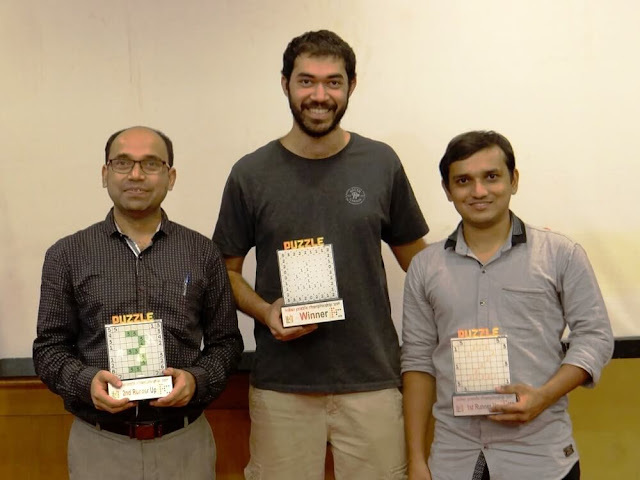 For each individual top 3 scores out of these four tests were considered to rank the participants and then top 50 were called for the offline Indian Puzzle Championship 2017 finals in Chennai. My rank was 3rd on these online rounds. It was my score in last online round of Puzzle Ramayan in which I scored best among all the participants gave me confidence for the offline finals and I was looking forward for podium finish in this championship. 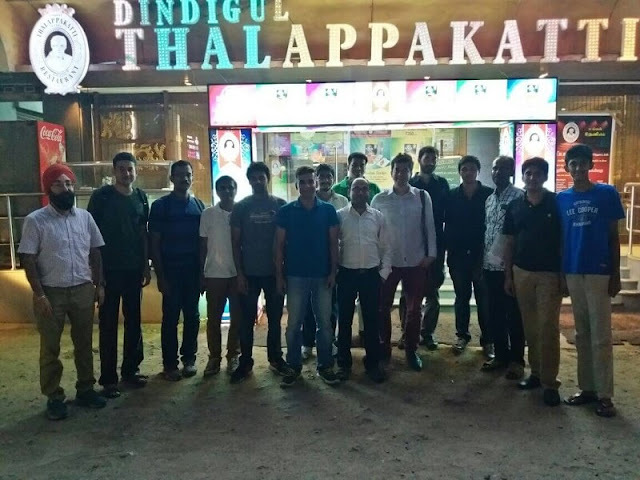 Once Indian Sudoku Championship 2017 and Sudoku Mahabharat ended on 29th July, 2017, immediately most of us grouped together and most of us were hungry. Our experience of dinner was not very good for previous day in Hotel Chariot. So all of us decided to go out for dinner. I could not remember and pronounce the name of the restaurant. Thanks God we have we one photograph at the entry of this restaurant. Its name was "Dindigul Thalappakatti". In short it means "The Turban Man". After the dinner we had a great round of board games before ending the day. Indian Puzzle Championship (IPC) started 1 hour earlier than the previous day. Most of us reached online for IPC. As previous day our registration was done, we did not required to register again for this championship. There were some new participants who has not participated in Indian Sudoku Championship. Registration was required for such participants. Below is the group photograph of all the participants of the Indian Puzzle Championship 2017. Trophy designs of Indian Puzzle Championship 2017 were very good and these designs were liked by almost everyone. Winners trophy was created using Slitherlinks puzzle with all the hints given at the all sides of the puzzle and one is written in the center with all the hints being 1. Similarly 1st runner up trophy is made using Four Winds Puzzle with some hints given on the sides and 2 written in the center with number 2 in each cell. 2nd Runners up trophy of IPC 2017 was designed using Fillomino Puzzle with central part made number three by using number 3. In this trophy all the central 3's were highlighted with Green color and thus number 3 was quite visible as compared to other two trophies where central numbers were not highlighted prominently. This round contained most of the Classic Puzzles which were part of the 4 online qualifying rounds. This round contained puzzles like Yin Yang, Battleships, Masyu, Skyscrapers, Fillomino, Slant, Dominos and Hungarian Pentominos. Most of these puzzles were my favorite puzzle types except Hungarian Pentominos puzzle. I had not prepared much for this round was was (over :)) confident of finishing this round. I started this round with Dominos Puzzle and could quickly solve it, then moved to Masyu which again was easy one and then stated from 1st puzzle Yin Yang and completing each of the puzzle in sequence. Most these puzzles were easy and I could solve these puzzles very quickly with some stops while solving Fillomino puzzle. I completed seven puzzle and when I started last puzzle Hungarian Pentomino, there was still 14 minutes of go for this round. I found this puzzle as tough may be because I was not prepared very well for this puzzle type. I took my 13 minutes to put most of the Pentomino for this puzzle and in the last minute there were still 3 more Pentominos to go. I could not think of any further logic and there was not much time left to logical solve this puzzle :). So I guess at the very end to complete this puzzle with just 10 second remaining to finish this round. I was happy that I could complete this round but I could not get any time bonus in this round. When the result of this round came, Rohan and myself were the only two players to complete this round. Rohan completed this round with 8 minutes of time bonus. 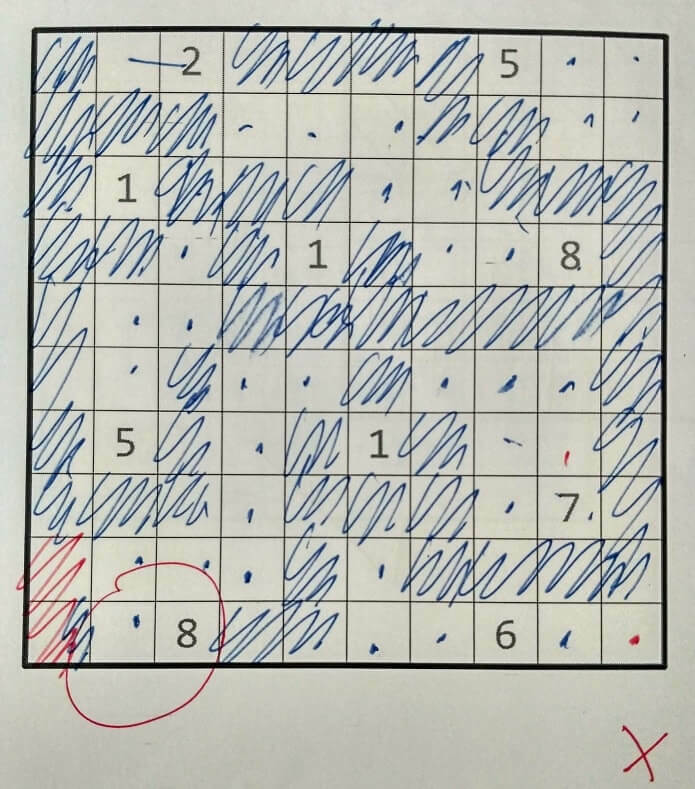 When I got my booklet, I found that I have made very small error in Battleship puzzle. 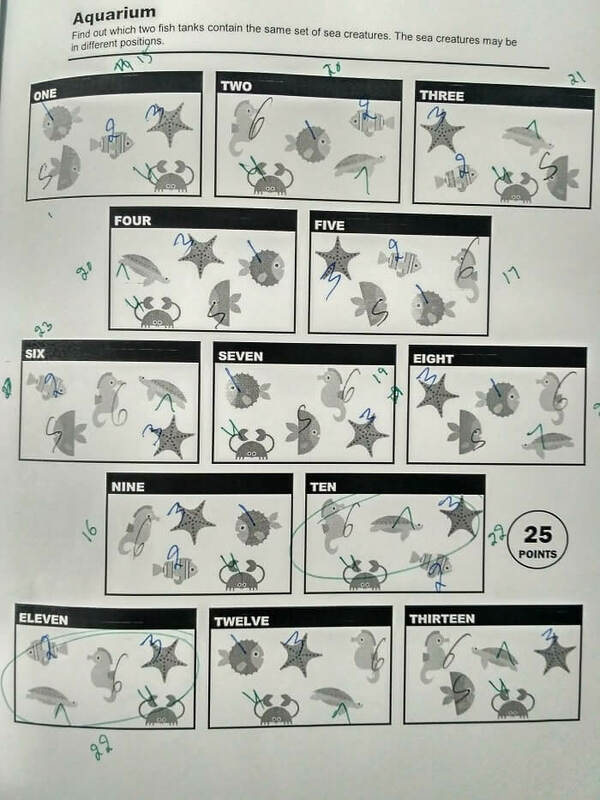 In fact organizer who corrected this booklet missed this error and I was awarded full points for this puzzle. I pointed this mistake to organizers and my score when down from perfect 400 points to 357 points. However I was happy to make this correction and I was later awarded with "Fair Play Award" for this act of honest :). In fact Ashish has won "Fair Play Award" during World Puzzle Championship 2016 in Slovkia. There are many puzzles on this website in which one has to find the mistake in the given picture. 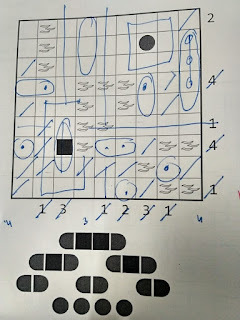 I am posting photograph of Battleship puzzle which I solved and which was at first instance marked correct. 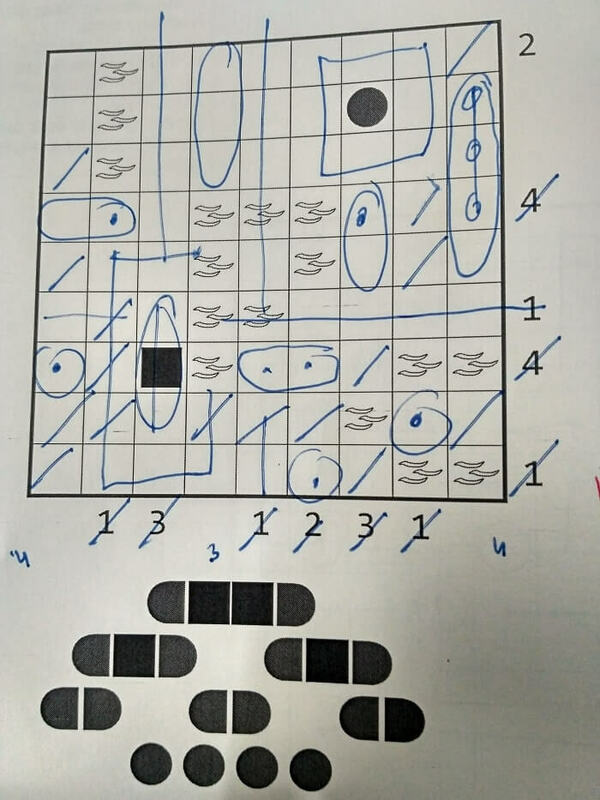 Challenge for the readers here is to find the mistake in this solved Battleship Puzzle? This round again contained the Classic Puzzles. However none of these puzzles appeared in any of the online rounds. This the reason this round this named as "The Other Guy". This round contained Classic Puzzles like Nurikabe, Tents, Anglers, Hidato, Kakuro, Double Back, INDIA Division and Penta Blokus. Most of these types were known types to me except Double Back and Hidato. During my preparations for IPC 2017, I tried to concentrate on these two types. 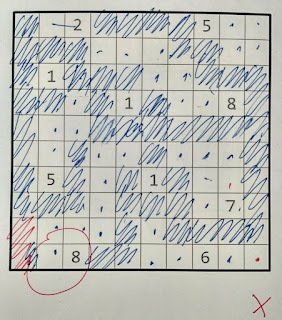 In this round I started with Kakuro as this puzzle type is one of my favorite puzzle type. I could solve it quickly. Then I stated INDIA Division. After getting a good start in this puzzle, I could not proceed further in this puzzle. I left this puzzle for to be solved later to finish other easy puzzles like Nurikabe, Tents, Anglers and PentaBlokus. Later I came back to INDIA Division puzzle and solve it with some logical conclusions. Now only 4 minutes were left on the clock and I was having big pointer Hidato to be completed. 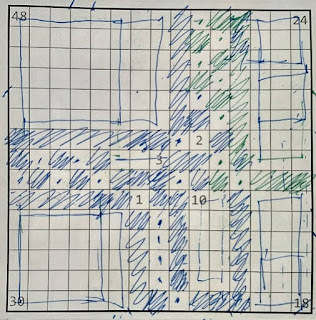 I could logical guess the tentative path and positions of numbers but could not complete this puzzle. So with bigger pointer left to be solved, I was still satisfied with solving 7 of the 8 puzzles in this round. The Hangover was round 4 but during the championship, but we solved it as third round. This round was Causal Puzzle round but it was second highest pointer round with minimum time allocation for this round. This round contained many causal puzzle with Scale Sudoku and Futoshiki Puzzle being featured in this round. This round contained puzzle which requires Observational Skills, Mathematical Skills along with Logical Skills. I could solve few puzzles in this round scoring 175 points only out of total possible 500 points. One good thing about this round was that I had not made any mistake in this round and to my surprise I was 3rd best scorer in this round with Rohan scoring 320 in this round to keep his unbeaten record intact :). There was one interesting puzzle in this round called Aquarium. In this puzzle, there were different fish tanks having different sea animals in it. One has to find the fish tanks which contains the same set of sea creatures. To solve this puzzle, first I tried to visual find the tanks which contained the same sea creature. I could not find it out visually. 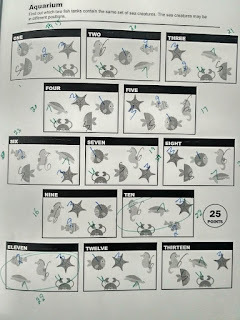 Then I marked each sea creature with a number e.g. 1, 2, 3, 4 and so on. I will mark the same number for same sea creature in the different tanks. At last I summed up all the numbers to find out which two tanks contains the same sum. There were three tanks which summed to the same number. Then visually I found the two tanks which were the answer of this Aquarium puzzle. This round contained many puzzle types which seemed new puzzle types to me. 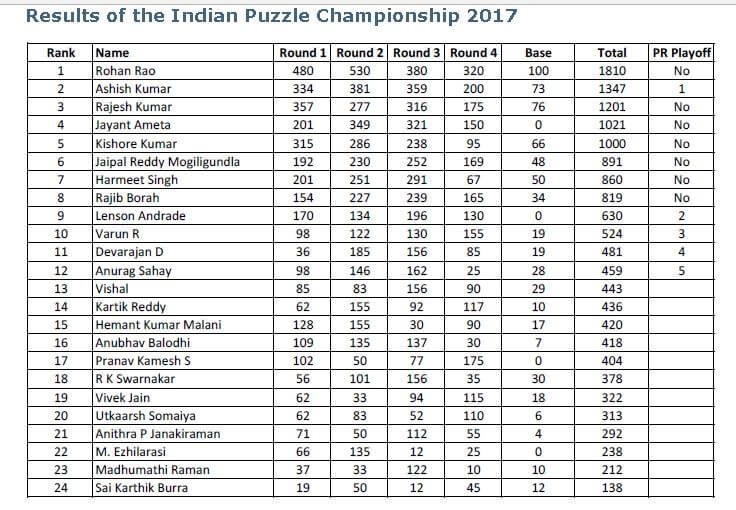 During my preparation of IPC 2017, I have to prepare most for this round as almost my the puzzle types appearing in this round were new to me even though these puzzle types has been there in some of the previous World Puzzle Championships or other line online Puzzle Championships. This round contained two puzzles of same type with one being the small puzzle and another being big puzzle. In total it contained 7 puzzle types with 14 puzzle in total. 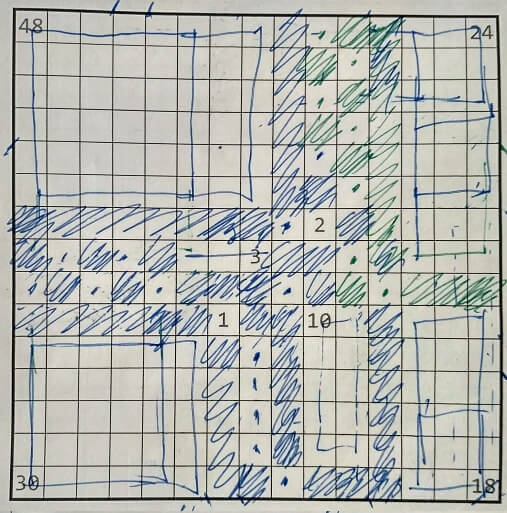 In this round I spend a long time to solve big pointer Mochikoro puzzle. I made one wrong assumption in this puzzle with the 18 hint given at lower right corner always thinking that 9x2=18. I tried both the horizontal and vertical combination of 9x2 rectangle but could not solve this puzzle :(. Later by the time it stuck that 6x3 = 18 can also be one combination, I wasted lot of the precious time completing this puzzle. It was very nice puzzle made by Nikola Zivanovic. I could not complete 5 puzzles in this round with both Summon and Hidden Words untouched and solving only the 1st puzzle for Shape Division. I could score only 316 points in this round and thankful I have not made any mistake in this round :). Rohan won this championship with the huge margin of points. He has won Indian Puzzle Championship title 5 times equalizing my record of 5 times Indian National Puzzle Champion. Ashish got well deserved 2nd place in this championship and I was happy that after a long hiatus, I could get the podium finish (3rd place) in this championship along with winning the "Fair Play Award". 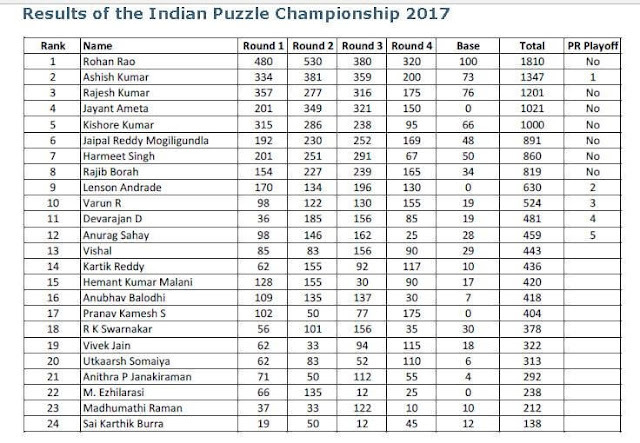 All the three winners of IPC 2017 are part of World Puzzle Championship (WPC) 2017 organizing team. So Indian Team A will consist of Jaipal, Jayant, Harmeet and Kishore. With the end of all the 4 rounds of IPC, it was time for some recreational activities. For the previous day when Indian Sudoku Championship took place, the recreational activity was Classic Sudoku Master 2017. However for puzzle, we had Pocket Puzzles Team Tournament which was equivalent to Classic Sudoku Masters (CSM). This different between PPTT and CSM is that CSM is the tournament which Player Vs. Player knockout format whereas PPTT is Team Vs Team tournament but this was not knockout format. In the CSM the player losing a match is immediately knocked out of the tournament but in PPTT in case a team lose a match is moved down in ranking. There were 8 teams in this round and I was the team captain for one of the team. Our Team could not perform better with we losing all of our matches. Team Harmeet won PPTT with winning all of their matches. However before starting this Pocket Puzzles Team Tournament, I had arm wrestling competition with Jaipal and later with Shaheer. A big thanks to authors and testers Bram de Laat, Nikola Zivanovic, Richard Stolk, Tawan Sunathvanichkul, Walker Anderson Dewey, Yuki Kawabe, Tiit Vunk and Prasanna for providing the high quality Puzzles used in the event. Also thanks to Chennai people for the hospitality we received.